Microsoft is billing the Surface Book as “The Ultimate Laptop” which is a pretty lofty goal, especially for a first generation device. 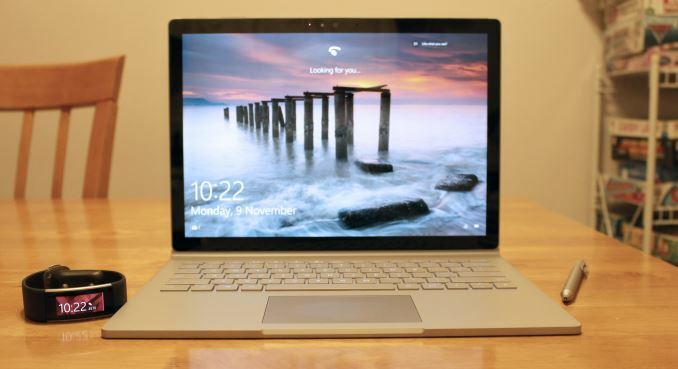 Unlike the Surface Pro line, which is only just now seeing competition from other vendors, there are plenty of other Ultrabook-style notebooks on the market. In fact, over the last year, there have been some pretty great notebooks released. The Surface Book is coming to market at a time where other Windows OEMs have released some pretty excellent devices. One thing that Microsoft nailed is the build quality. The magnesium shell has a great feeling to it, and it’s not exactly like aluminum either. The brushed finish feels great in the hand, and just like the rest of the Surface lineup you get a very solid device. It’s not light, especially if you consider 3.34-3.48 lbs (1.51-1.58kg) heavy. Comparing it to the amazingly thin and light machines released in the last year, it does feel a bit heavy. It’s amazing how much this has changed. The extra mass has been put to good use though, with a solid chassis packed with batteries. The design of the hinge is a feature that is very interesting. By having it unwind it creates a more stable base. When closed, the Surface Book just yells out that it’s something different, and while there is a gap, it’s put to good use by allowing for longer travel on the keyboard. The design of the hinge mimics the look of an actual book, which is a great way to tie into the theme. Meanwhile performance is fantastic, thanks to the 6th generation Intel Core processor. The dual-core options of a Core i5-6300U or a Core i7-6600U put these at the top end of the spectrum for the 15 Watt parts. It’s unfortunate that Microsoft did not opt for anything with Intel’s Iris graphics line for the Surface Book like it did for the Surface Pro 4, but the optional NVIDIA GPU more than makes up for it. In pretty much all tasks that are GPU bound, the NVIDIA GPU is roughly twice the performance of the integrated graphics. The custom GT 940M with GDDR5 memory is a pretty nice addition to the notebook. Most Ultrabooks don’t have either the room or the cooling to support a discrete GPU. Microsoft has thought outside of the box here by adding the GPU in the base, while the rest of the components are in the detachable Clipboard. Microsoft compared the Surface Book to the 13-inch MacBook Pro, and I think that while that is a great device to target, the two products are quite a bit different. Apple’s 13-ich Retina MacBook Pro uses 28 Watt processors as well as Iris graphics. On CPU bound tasks, I would expect the MacBook Pro to maintain an edge, although on GPU bound tasks it might not be the same story, assuming you have the NVIDIA dGPU in the Surface Book. As a tablet, the 13.5-inch display with full Core i7 on tap is a powerful combination. Being Surface, it of course supports the Surface pen, and performance is decent with not a lot of lag. There is still some room here for improvements, but overall the pen experience is very good. 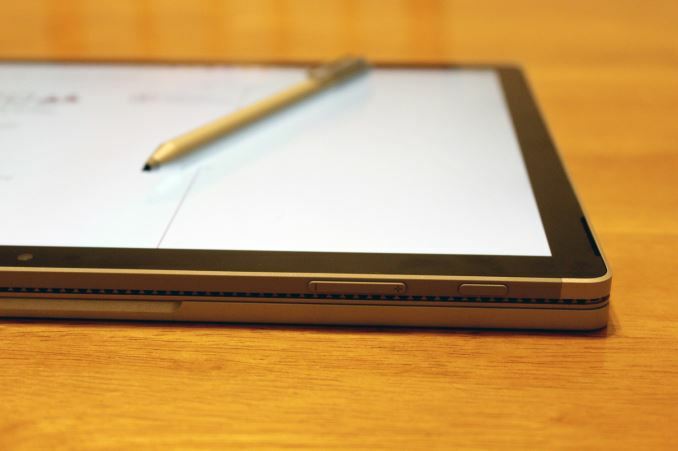 Just like the Surface Pro 4, the pen offers an eraser on the top, and can be stored by attaching it to the side of the display with magnets. The magnetic holder is strong enough that it’s not going to just fall off randomly, but it’s not as strong as a physical connection so if you put it in your bag, the pen may not be attached when you pull it back out. That’s a pretty small issue though. The Clipboard is not going to be as good of a standalone tablet as something like the Surface Pro 4 though, mostly because of the reduced battery and lack of a kickstand. But for short sessions, the very thin and light Clipboard works well. Around the house, there have been several times where it’s been very nice to be able to detach the display to show off a video clip, or look at some maps. If you want to use it as a writing or drawing device, you can also remove the display, and then flip it around and re-attach it to the base, which gives you a nice angled surface to draw on. As a notebook, there is a lot done well here. First off, the amazing display has accurate color, and the best contrast ratio of any notebook we’ve tested. It’s also a 3:2 aspect ratio, just like all of the other Surface devices now, making it a much taller display. Doing office work on it is very nice, and with the number of people not in love with the move to 16:9 displays in notebooks this alone may be a good reason to consider the Surface Book. The display size is deceiving because it’s a 13.5-inch panel, but due to the aspect ratio, there is more screen real estate than a 14-inch notebook (84.12in^2 vs. 83.75in^2). It also features front facing stereo speakers, which actually sound good considering the thickness of the device. Meanwhile the keyboard features 1.6 mm of travel in the keys and the layout is pretty standard. I would like to see full sized up and down arrow keys, but it’s really not too bad to get used to the half-height ones which I’ve used on many other notebooks. I quite like the function toggle, because for some tasks, you really need the F keys to just be the default. Most notebooks default to the other functions. Having the button as a toggle with a light, just like caps lock, is a great way to implement it. The trackpad is also very good. It is nice and large, and very smooth. The Precision touchpad drivers offer quite a bit of customization of multi-touch gestures, even though they don’t go quite as far as some of the other touchpad vendors do. Out of the box, I found it a bit too slow, but that was easily corrected in the control panel. Battery life of the Surface Book is pretty impressive, especially on the Core i5 model with no dGPU. The overall battery life sets a new record on our light test, and this is despite the high resolution display. Compared to other high resolution notebooks, there really is nothing even close to this right now. The Core i7 model with the NVIDIA dGPU could not reach the lofty results of its Core i5 brethren, but it still did very well, thanks in no small part to the impressive 70 Wh of battery capacity. All is not perfect with the hardware of course. There is a noticeable lack of ports on the Surface Book, with just two USB 3.0 ports on the left side. The right side just has a DisplayPort output, as well as the Surface Connect port for docking or charging. The tablet itself has no ports at all except for the headset jack. Microsoft did include a SD card reader in the base, but it only accepts the card about half-way in, so you can’t use it to increase storage like you would be able to on the Surface Pro 4 with it’s microSD card slot. If you do need more connectivity you would have to turn to the Surface Dock, which offers two DisplayPort outputs, along with four USB 3.0 ports, and Gigabit Ethernet. The other issue with the hardware is one that plagues all 2-in-1 devices which offer a detachable display. Because the display has to house all of the PC components it gets heavy. The Surface Book display/Clipboard is 1.6 lbs (726 grams) and all of this weight is out over the hinge. The Surface Book does better than any other detachable convertible device for balance, but at the end of the day it is still more top heavy than a traditional notebook. On a desk it’s not going to be an issue, but if you do have to type in your lap, depending on the seating arrangement, it may want to tip backwards. This is compounded by the feet on the bottom not having a lot of grip. The Surface Book’s display travel is also limited to prevent it from tipping over, although it does open far enough that it should not be an issue for almost any situation. The hardware is overall very good. Where the Surface Book is let down though is on software. It’s kind of ironic that the hardware is well done but the software can’t keep up when you consider Microsoft is first and foremost a software company, and one that has only been in the PC market for a couple of years at that. But there have been a lot of issues with software. 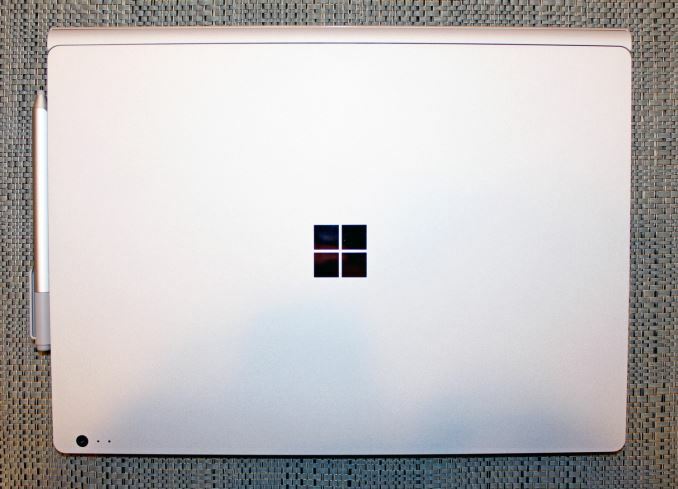 When the Surface Book first launched, it suffered from display driver crashes along with hue changes and flickering on the screen when doing certain tasks. Luckily these issues seem to have been corrected with a firmware update issues on November 2nd. But there are still outstanding issues. The fact that you can’t close the lid and expect the laptop to actually go to sleep is a terrible bug. Leaving the Surface Book unplugged but sleeping is going to result in a dead battery. Just yesterday, I closed the lid on the Surface Book, only to notice the fans had kicked in and it was very hot. It seems to get burn more power when it’s supposed to be sleeping then when it’s actually doing a task. There have been reports of other issues as well, but the main ones I suffered from had to do with power. Running the battery rundown tests was not always a great experience, since sometimes it would, for almost no reason, just burn through a bunch of battery. Some of the software is great too. Windows Hello is enabled with the Surface Book’s front facing camera, and once you’ve used facial recognition to login you just never want to go back. The login is very fast, and I’ve had no issues with it recognizing me in almost any condition. Bright sunlight can be an issue, since it does use an IR camera and that would be overloaded in direct sunlight, but other than that situation it’s been great. Windows 10 fits this device very well with it’s desktop mode and tablet mode, although for bugs that I’ve already listed earlier in the review, the automatic switching is disabled out of the box. At the moment, manually switching modes appears to be the best way to handle that. At the end of the day, the Surface Book feels like a device that was kept secret. The secrecy was great for the unveiling, since there were only vague rumors of such a device to be announced at the Microsoft devices event in New York, but that same secrecy has, I believe, led to superb hardware being let down by immature software. And then there is price. The Surface Book is not an inexpensive device. Microsoft is playing at the very top of the market with this offering. Prices range from $1500 for the base model with Core i5/8GB/128GB, all the way up to a staggering $3200 for a Core i7/16GB/1TB/GPU model. That’s a lot of money for an Ultrabook. The NVIDIA dGPU alone is a $200 upgrade on the Core i5 model. You can easily get a more powerful system for less money, but when you look at the high end it’s never a linear relationship of cost versus performance. 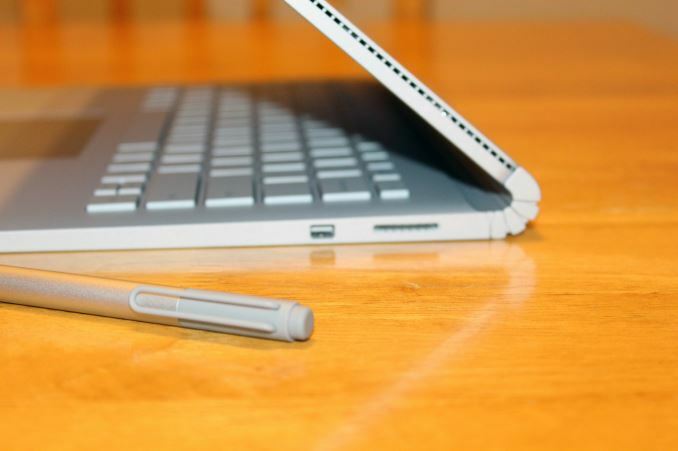 The Surface Book offers some of the nicest hardware in any detachable convertible. I think despite the price Microsoft is going to have customers for this. The question is will they get the bugs sorted out. The first firmware update fixed a lot, but there are still too many outstanding issues to recommend the Surface Book at this time. 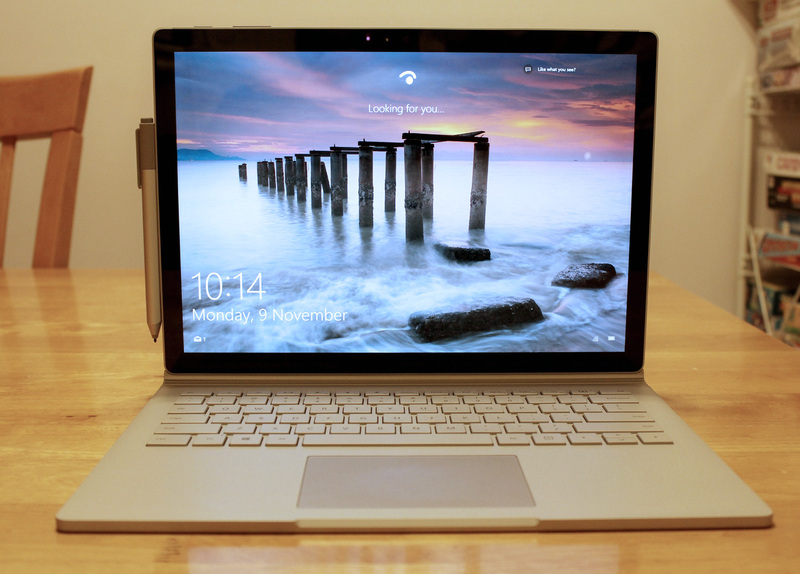 Hey anandtech why does the reality distortion field not extend to the Microsoft surface? MacBook Pro goes north of 3k easy. Apple Watch 15k lol. Funny how we never hear how overpriced apple products are because they are so 'wonderful', but here u have a magnesium shelled beauty being compared to plastic acer ultra books. So the i7 SB is actually $100 closer to 13" MBP pricing than the 15"
You might want to double check that.. 13' rMBP are actually using skylake processors. The 15' rMBP are still stuck on haswell. "njoy incredible performance from the fifth-generation dual-core Intel Core i5 or i7 processor. Your 13-inch MacBook Pro with Retina display comes standard with a 2.9GHz dual-core Intel Core i5 processor. You can upgrade the processor up to a 3.1GHz dual-core Intel Core i7.